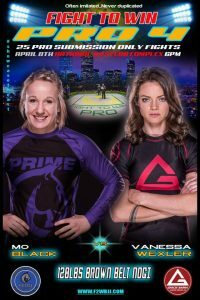 Prime BJJ will be supporting one of its most decorated athletes, Mo Black, for her fight on Sat April 8th at the Fight to Win Pro 4 in Denver, CO.
Mo Black, a Brazilian Jiu-Jitsu purple belt, has been matched up with Gracie Barra’s Vanessa Wexler, a Brazilian Jiu-Jitsu brown belt, for the 120 lb Brown Belt No-Gi division. Mo is no stranger to competing. While she’s only been training BJJ for less than 4 years, she’s competed in numerous competitions to include local tournaments, and International Brazilian Jiu-Jitsu Federation (IBJJF) tournaments all over the country. A few of her titles include both Bronze and Silver medals in the renowned IBJJF Pan American Championships, double Gold medals in the IBJJF 2015 Summer Atlanta Open (both gi and no-gi), IBJJF Irvine Open Silver medalist fighting one weight division up as her first competition at purple belt, and a long list of 1st place rankings in the Colorado Fight to Win tournaments in both gi and no-gi. Mo’s tenacity to compete and constantly challenge herself as a fighter can been seen in the upcoming fight she has accepted against her opponenet, Vanessa Wexler, who has more experience than Mo and outranks her by a whole belt in BJJ. Even though she’s a fighter at heart, Mo is also passionately involved in coaching both adults and kids at her gym, Prime BJJ. Her entire team will be supporting her and cheering her on for the April 8th fight coming up! Get your tickets to come and support Mo Black at cagetix.com/f2w. Be sure to select “Fight to Win Pro 4 Denver” event, and select Mo Black as your fighter. An example is pictured below.